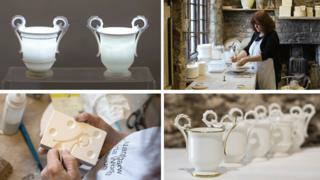 New pieces of porcelain have been made in south Wales after recreating a 200-year-old recipe of what was once declared the finest of its type. Experts used analysis to work out the recipe and months of testing to produce a series of cabinet cups at Nantgarw China Works museum, near Caerphilly. They wanted to use the project to highlight the work of potter William Billingsley who created the recipe. The cups will be given to contributors who helped fund the £15,000 project. Items made at the works from 1817 were highly revered for their whiteness, fine grain and translucency. But the process and components were kept a secret and, as the product was difficult to fire leading to losses of up to 90%, it eventually led to the closure of the works in 1821. An open day is being held on Sunday to show off the new porcelain and explain how using modern knowledge, techniques and kilns they have overcome many of the hurdles faced at the original china works. Billingsley was a ceramic painter as well as as a potter but the team involved in making the new porcelain focused on the material and the process rather than the decoration. Project manager Charles Fountain said he was pleased with the results but there was still work to be done to improve the finished product. He hopes further funding can be secured to commission contemporary ceramicists to create new work from the recipe. "We wanted to raise awareness of the importance of Nantgarw China Works in porcelain production and to ensure it and Wales has a place in future ceramic production," he said. After porcelain production ceased, the factory switched to making stoneware bottles and earthenware until it closed in 1920, before later reopening as a museum. For 200 years the exact formula and production methods have remained a mystery. But recent analysis and research, including coded documents found in museum archives, provided the opportunity to recreate it for the first time.